Creator God, who loves pilgrims everywhere, thank you for the journey of your saint, Ignatius of Loyola, who marked the path for those of us who follow his example in following Jesus. Thank you for drawing Ignatius to your grace and to a life of spiritual discovery. Thank you for teaching him about prayer so that he could teach us. Thank you for using a person so obviously imperfect, so that we could have hope for ourselves. May we continue on our journeys—as individuals and as the Church— following Ignatius’s example of persistence, humility, courage, and gratitude. May we grow to love you more dearly with every step we take. May we invite others to walk with us, and may we become loving and faithful companions to all who journey toward you. St. Ignatius of Loyola is the founder of the Society of Jesus. He is known mostly for developing the Spiritual Exercises that Jesuits still follow to this day. 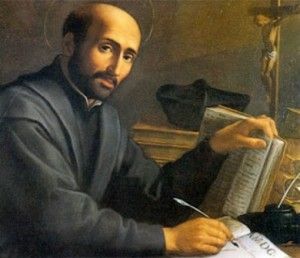 The spirituality of St. Ignatius, (Ignatian Spirituality) was founded mainly on his own transformation from the experience of the Spiritual Exercises. A glimpse of this spirituality can be gathered from the quotes and sayings of him, such as – “Ad Majorem Dei Gloriam,” (For the greater glory of God) which guided all his decisions and actions.